We’re pleased to be partnering with Dailys Catering for this 2 part, locally unique event. Limited space is still available! A concern about the composition of commercially produced food, genetically modified crops and a seemingly endless litany of food recalls has spurred many people to become more knowledgeable about the source of their sustenance. The rise in kitchen gardens, the opening of more farmers markets each year, and the conversion of empty urban lots to community gardens are definitive signs of a surge in the local food movement, allowing us to have a solid grasp on that which nourishes our bodies. Add to this a swelling interest in wild foraging for both food and medicine, and it becomes clear that we are taking self-reliance much more seriously. This can have many excellent benefits for our environment. But with this rediscovery of “homegrown” comes an important responsibility, particularly in our foraging and wildcrafting. To understand how to be an ethical harvester of wild plants, one must become well-versed about these species beyond just what value they bring to our own personal well being. In addition to the “Six Knows” of harvesting wild plants, we must also consider the following. Know the plant’s value to other species: We are not alone on this planet. While humans can grow their own food, wild animals depend upon naturally occurring plants for their sustenance. If a plant you wish to harvest is an important food source for another species (including insects), evaluate its local availability before harvesting. If its occurrence is limited, perhaps you can forsake the harvest in this location, finding a more prolific source, or forgo that plant altogether until it becomes more established. Understand the plant’s life cycle (reproductivity): Many plants are like animals in that they take some time to reach sexual maturity. Harvesting a plant before it has begun reproductivity can compromise the future population of that species. Trout Lily (Erythronium americanum) is an excellent example. While it is a perennial, it takes up to five years for it to reach flowering age. We want to avoid harvesting the Trout Lily in its first year of flowering, which we can determine by the presence of two leaves, instead of one. So, please enjoy your foraging but remember to take no more than 1/3 of a complete stand and become acquainted with the aspects of your selection to ensure its future availability for the many species who rely on these wonderful gifts of nature. Using the wonderful wild plants of Earth can result in so many benefits for our physical and spiritual health. However, all due care should be used in this process. And remember to be a responsible forager. When harvesting, ALWAYS LEAVE PLENTY OF SPECIMENS BEHIND! We want our wild herbs to reproduce so be sure to take no more than one-third (1/3) of a stand. In addition, certain plants only should be harvested during certain phases of their life-cycles. 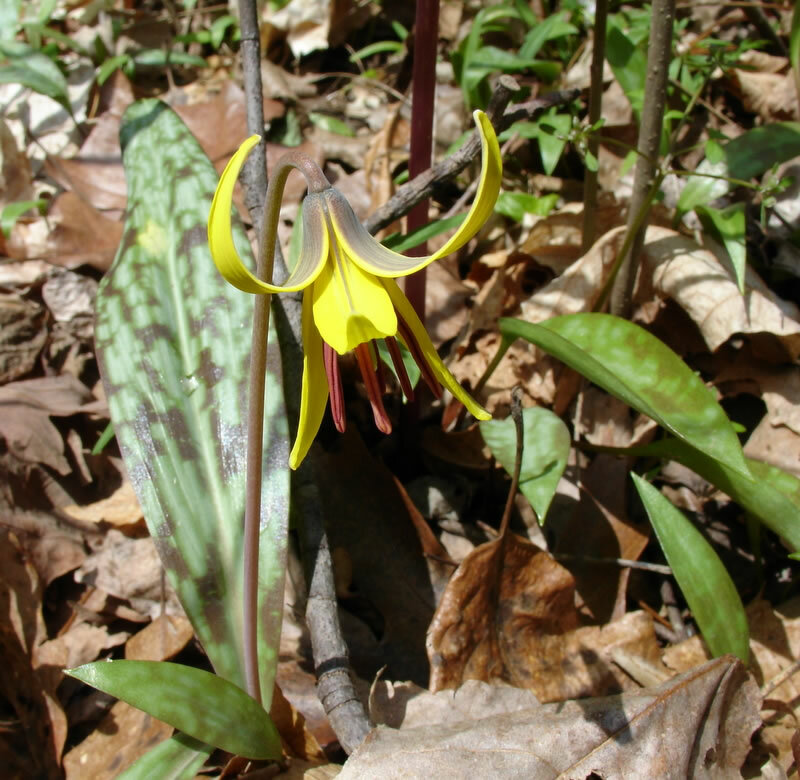 For example, Trout Lily should not be harvested if the specimen displays more than one leaf; it takes this plant more than one year to flower so do NOT harvest it if the plant is showing two leaves otherwise it may fail to reproduce. Also, if the plant is endangered (i.e. American Ginseng, certain ferns, etc. ), DO NOT HARVEST – it might be illegal and certainly does not help them propagate for future survival. And remember, wildlife depend SOLELY on food available in the wild so be sure you are not taking from our fellow species. We can grow our own food but they cannot. If you are not certain on any of the following, do not harvest but get assistance from a professional botanist, naturalist, or herbalist. We enjoy helping others learn these important skills. 1. Know the Species/Positively Identify: Do not presume what you are looking at is the correct plant. Refer to recommended field guides and use ONLY scientific names for proper identification. Many plants have the same common name but one may be radically different from another (Sumac, for example, can be beneficial or poisonous depending on the species). Always know the plant family because it may also be a potential allergen. 2. Know the Environment: Be certain that the area where the plants are growing is clean and free of potential toxins or wastes. For example, never harvest plants from along side a well used trail – quite often people walk with their dogs and we all know that dogs like to mark trails! Also, be cautious along roadsides – salt, asphalt and oil all have very negative impacts. And be sure you are not in a runoff area for roads, industry, conventional farms or livestock. 3. Know When to Harvest: Timing is everything when it comes to harvesting. The beneficial properties may be best at a certain time of the growing cycle. For example, Dandelion greens are best BEFORE the plant flowers. Sometimes a plant can become toxic after a certain point (Milkweed, May-apples). Some plants should be harvested in a specific year (particularly true for biennials). Be well versed in knowing the proper time to harvest wild plants. 4. Know the Plant’s Purpose: What effects will the plant have on the physical system? Be sure you know all the potential uses of the plant. Some plants are natural stimulants, others depressants, some are diuretic or cathartic, some have multiple uses (often depending on which part is used – see below), etc. Also, make sure you are aware of any potential interactions with medications or other herbal preparations you are using. 5. Know Which Part to Use: Some plants are usable in their entirety while others may have poisonous constituents (think Rhubarb). Do your research and know what part of the plant is helpful and what may not be. 6. Know How to Prepare: Plants can have a wide range of preparatory requirements from none to aged for months. And often the type of preparation is related to the benefit you are looking to gain from the plant. Some plants require preparation before consumption (Nettles) while others lose all benefits from being over-processed. When you have a good working knowledge of all these KNOWS, you are in a good place to forage in the great outdoors for our botanic friends. If you have any question, hook up with someone who “KNOWS THESE KNOWS”. Happy harvesting!